Height: Front 5.25", Rear 6.75"
Does Weiand 8012 fit your vehicle? 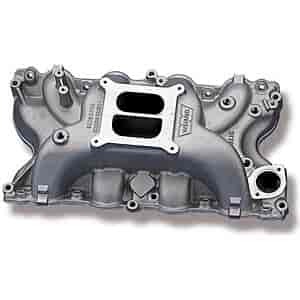 8012 - Weiand Stealth Intake Manifolds is rated 5.0 out of 5 by 3. Rated 5 out of 5 by Larry4444 from Great looks I put this on my 1969 429 Thunderjet. Works great, fit perfectly, but carb sits a bit higher than I expected. Rated 5 out of 5 by the Wolfeman from Great quality with a great price. I expected it to be a good part and it did not disappoint. It is as good as it gets- no different from others I have purchased in the past, great finish with no flaws. Does this intake have an exhaust crossover under the carb, nobody shows the bottom or the ports of this intake. This intake manifold does not have an exhaust crossover under the carb.